shop Bowjax Revelation Split Limb Black Dampener | bargainbrute. 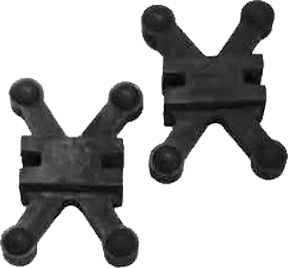 The X-shaped limb dampeners wedge snuggly between the limbs, without screws or adhesives. Weighing only 269 grains a piece, you can double them up on a limb and they still weigh less than the competition. The dampener arms move freely to reduce vibration and to save the life of your limbs. Fits 3/4" split limb gap, a common fit for Hoyt, Bow Tech, and Tenpoint bows.